A specialist label manufacturer in Peterborough, UK, has been awarded a £43.3k GBP contract to print seven million cryogenic labels for Imperial College London’s epidemiology department and supply an additional 350,000 plain labels. Family-run AA Labels will supply 100,000 A4 sheets of cryogenic labels to the College’s School of Public Health, based at St Mary’s campus in Paddington, London, for use in a multicenter research study. The 25mm by 25mm square labels will be pre-printed and color-coded by AA Labels with variable data and QR codes for use on PP vials, tubes and storage boxes within its research department. The labels are designed to retain adhesion and quality in liquid nitrogen storage tanks over long periods of time, down to temperatures of -196 deg C, as the print is permanently fused to the label surface (facestock). 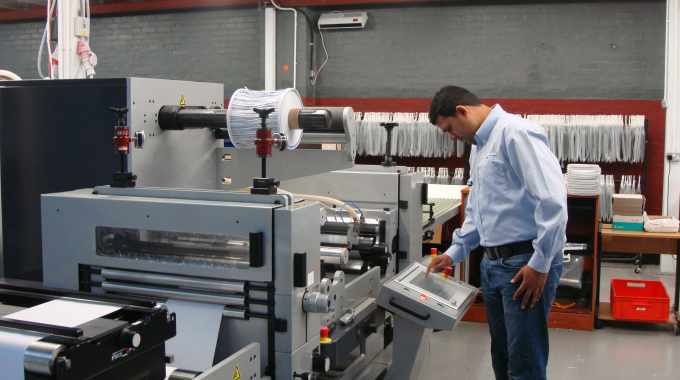 The printing of the labels will take place on AA Label’s HP Indigo WS6800 press, subsequently being cut from a roll into A4 sheets and batched. The printing process, incorporating batching, checking and quality control intervention, will take two weeks to complete, with all labels delivered in a single batch comprising two pallets. Ian Axelsen, business development manager at AA Labels, commented: ‘This is a large order for printed cryogenic labels and reinforces AA Labels growing reputation as a supplier of specialist materials to the bio-medical sector. ‘We have worked closely with the material’s manufacturers research and development department and the customer to ensure the correct specification for the adhesive and face-stock for this application. ‘These specialist labels are designed specifically to withstand extreme temperatures and multiple freeze-thaw cycles, for example in ice water or warm water, and retain their quality after being returned to the liquid nitrogen storage tank. ‘These unique qualities make them ideal for the labelling of cryogenically stored biological samples and information in various formats, including those used by the Department of Epidemiology and Public Health. AA Labels, based near Orton Longueville near Peterborough, specializes in designing, producing and printing labels for every major market and industry sector. Established in 2006, the business manufactures and distributes plain and printed labels in a range of materials, adhesives and finishes for commercial, industrial, specialist and home use.